President Hugo Chavez took the side of leftist rebels in neighboring Colombia's decades-old civil conflict on Friday, calling the guerrillas "true armies" and asking the international community to stop considering them terrorists. The statements from the fiery Chavez, emboldened by his success in freeing two rebel-held hostages, angered Colombia's U.S.-allied government, which has made eradicating the rebels its priority. The Revolutionary Armed Forces of Colombia, or FARC, and the National Liberation Army "are not terrorists, they are true armies ... They must be recognized," Chavez said. "They are insurgent forces that have a political project," he said in a speech to lawmakers. "I say it even though someone could be bothered by it." Chavez's words in defense of the FARC were the clearest and most pronounced of his presidency, and appeared to exacerbate tensions with Colombian President Alvaro Uribe even as the Venezuelan leader sought to play an increasing role as a mediator. The FARC - Colombia's largest guerrilla group - has repeatedly asked world governments to remove it from their lists of foreign terrorist organizations. 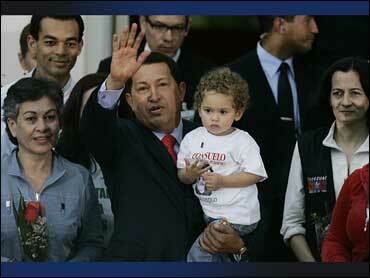 Chavez echoed that call, urging Europe and Latin American nations to resist "U.S. pressure." The European Union joined Washington in classifying FARC as a terrorist group in 2002, outlawing all economic support to the guerrilla group, which is accused of large-scale drug trafficking, hundreds of kidnappings and attacks on civilians. Jose Obdulio Gaviria, a close adviser to Uribe, reacted angrily to Chavez's call, saying: "The FARC uses violence against democratic government and civil populations. In the canon of international law, that makes them a terrorist group." Interior Minister Carlos Holguin said Colombia "cannot accept a request of this sort." Officials in Bogota were also irked that Venezuelan Justice Minister Ramon Rodriguez Chacin - Chavez's go-between with the FARC - appeared to express support for the rebels during Thursday's hostage release, and at least one pro-government party leader called for Chavez to fire him. "We are very aware of your struggle. You are the ones that have to maintain this effort," Rodriguez Chacin told the rebels in video footage of the handover. Chavez, a self-described revolutionary who named his political movement after South American independence hero Simon Bolivar, also called FARC's political leanings "Bolivarian." The Venezuelan leader's statements are likely to raise concerns in Washington, where officials have long suspected that Chavez clandestinely supports the FARC - a charge he denies. Chavez has said in the past that Venezuela and Colombia share a common history from Spanish colonial days and are essentially part of the same nation. That concept is likely to be uncomfortable for a Colombian government that has shown a resistance to Chavez's continental ambitions. The two countries were once both part of a territory known as Gran Colombia in the days of Bolivar, and Chavez said he hopes the hostages' release may presage "the era of ... the true resurrection of the unity of Gran Colombia, which is the only path to our true liberation to achieve equilibrium in America." "I'm not going to let down my guard because for me the resurrection of Gran Colombia is a commitment," he said. Chavez basked in praise for Thursday's release of two women who were held hostage by the FARC. After tearful reunions with relatives waiting in Caracas, the Colombians Clara Rojas and Consuelo Gonzalez greeted Chavez with hugs and kisses. Chavez said he hoped the success could be repeated for former Colombian presidential candidate Ingrid Betancourt and dozens of other captives, including three Americans. But he said that largely depends on Uribe. The guerrillas have offered to trade 44 other high-profile captives for hundreds of rebel fighters imprisoned in Colombia and the U.S. But Uribe has refused to let Chavez meet with FARC leaders on Colombian soil. The handover was the most important hostage release in the Colombian conflict since 2001, when the FARC freed some 300 soldiers and police officers. It was also a major triumph for Chavez after a series of setbacks, including his first loss at the polls in a December vote on constitutional changes that would have let him run for re-election indefinitely. The success thrusts him anew into the center of Colombia's conflict, despite Colombia's reluctance to his involvement. The FARC, in a statement published on a pro-rebel Web site, said the unilateral release demonstrated the group's "unquestionable willingness" to talk with the government about remaining hostages. Rojas was managing Betancourt's bid for the presidency in February 2002 when the two were kidnapped on the campaign trail. Rojas gave birth in captivity to a boy fathered by one of the guerrillas. Gonzalez, a former congresswoman, was abducted in September 2001. In an interview Friday with Caracol Radio, Gonzalez described how some of her fellow hostages would sleep, bathe and wash their clothes while chained by the neck. Gonzalez said she suffered bouts of malaria and leishmanisis, a parasitic disease, during long treks through the jungle. Her daily routine of sleeping on the ground and surviving on rice and beans was interrupted by aerial raids by the military. "When bombs are falling all around you, it's when you really understand the horror of war," she said. Gonzalez said she spent her first night of freedom catching up with her family until 4 a.m. about what she missed in captivity - including the death of her husband and the birth of a granddaughter. She said it was the first time she slept on a bed in six years.